Becky Bond and Zack Exley are digital iconoclasts who have been reshaping the way politics is practiced in America for two decades. 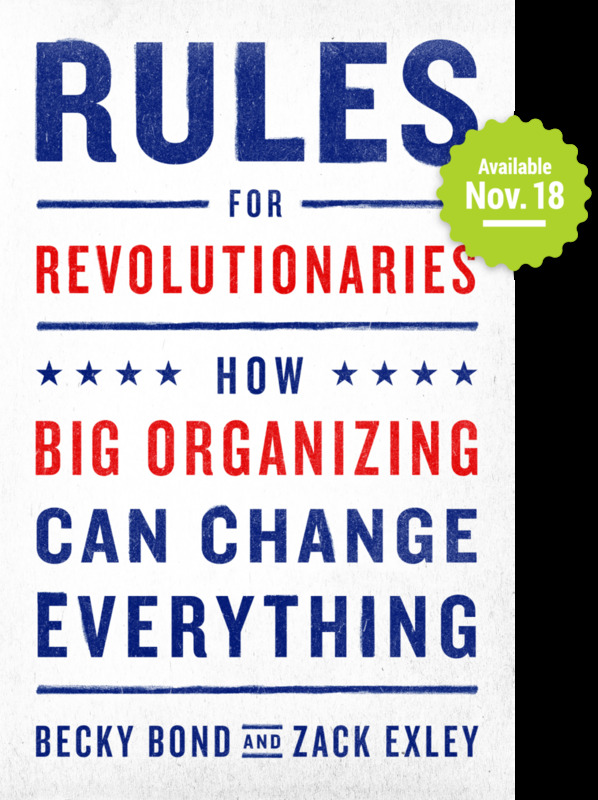 In Rules for Revolutionaries they have identified 22 rules of “Big Organizing” that can be used to drive social change movements of any kind. Becky Bond served as a senior advisor on the Bernie Sanders presidential campaign and was an architect of the campaign’s national, volunteer-driven grassroots campaign. Prior to joining the Bernie Sanders campaign, Becky served as political director at CREDO where she was an innovator working at the intersection of organizing, politics, and technology for over a decade. Becky is a cofounder of CREDO SuperPAC, which was named by Mother Jones as one “2012’s Least Horrible Super-PACs” for helping to defeat five sitting Tea Party Republican Congressmen. Zack Exley served as a senior advisor on the Bernie Sanders presidential campaign and was an architect of the campaign’s national, volunteer-driven grassroots campaign. Zack was a union organizer before becoming MoveOn.org’s first organizing director in its campaign to prevent the war in Iraq in 2003. As an early advisor to the Howard Dean campaign, he helped transfer MoveOn’s early fundraising and organizing discoveries into presidential politics, then served as John Kerry’s director of online fundraising and communications in the general election where his team raised more than $100 million online for the nominee. Subsequently, Zack worked as a consultant to global NGOs, campaigns and companies, and served as Wikipedia’s chief community officer and chief revenue officer. The people at Chelsea Green are truly revolutionary publishers and share Becky and Zack's commitment to empowering the American people to take down the corrupt political establishment and organize for change. Chelsea Green leads the industry both in terms of content—foundational books on renewable energy, green building, organic agriculture, eco-cuisine, and ethical business—and in terms of environmental practice, printing 95 percent of books on recycled paper with a minimum 30 percent post-consumer waste and aiming for 100 percent whenever possible. Chelsea Green also prints books in North America, as opposed to overseas like many publishers, with most of our printing partners based in the United States. The Chelsea Green approach is a perfect example of what is called a ”triple bottom line“ practice, one that benefits people, planet, and profit, and the emerging new model for sustainable businesses in the 21st century.